SP may know his work to be able to confirm, but I don't, the quality is nice though. Not come across the mark before, but a lovely piece. It does look a fine slipware charger but the picture of the mark is rather blurred. Is it just a B? Paul Barron, who Potty suggested, did make a little slipware around 1948 to 1951 but this is much more recent than that. Paul Barron's seal was an impressed B but much smaller than the mark on your charger. He also died in 1983 and I think this piece dates from after that as well. Studio agreed it does seem more modern , it is a B with a dot to the left which you can just make out in the pic. Oh well in time i may find who potted it , thanks all for the sugestions and help . I am still lucky enough to find potters of some of my pieces after having some of them more than 10/15 years some times a nice suprise . It seems very well made, surprised nobody has recognised it yet. with a 2mb camera it is not cutting the mustard with close up pics , but this stamp is verry clear and bold what i would class as an old TV lozenge with a verry distinct large raised B and to the left of the B just over halfway down a raised dot , i feel the raised dot is the answer to this potter. 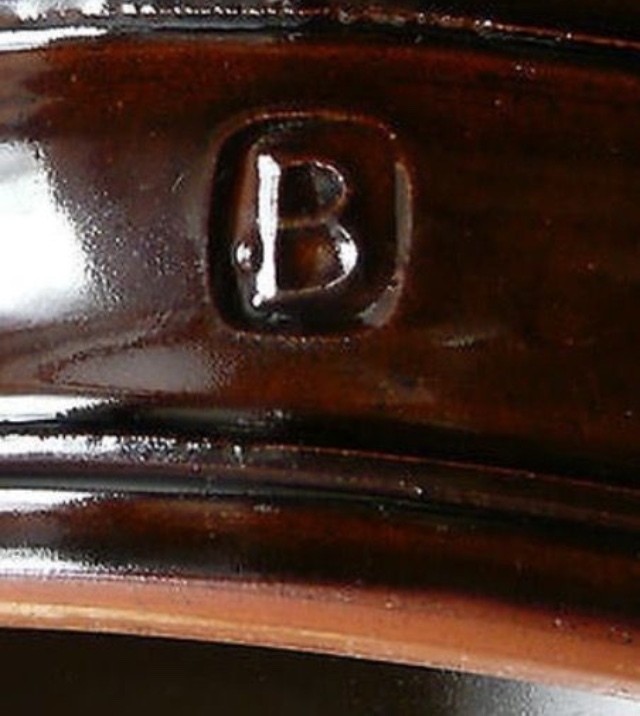 The mark well be that of Blenheim Pots & Plauqes which Lucienne De Mauny used in the 80s at Blenheim farm wallingford.Work included Slip Trailing in earthenware. Eclectic-Dorset wrote: with a 2mb camera it is not cutting the mustard with close up pics , but this stamp is verry clear and bold what i would class as an old TV lozenge with a verry distinct large raised B and to the left of the B just over halfway down a raised dot , i feel the raised dot is the answer to this potter.